For many homeowners in Nashville, their kitchen island is the signature design element of their entire kitchen. This is because a kitchen island, which stands alone in the middle of a room, naturally draws eyes toward it. Custom countertop cuts for your kitchen island will draw the eyes to a beautiful focal point, which complements the rest of the design and layout. Take a look at your kitchen and ask yourself: is it exactly the same as every other kitchen in Nashville? The same measurements? The same color scheme? Of course not! When it comes to building a kitchen island that matches your home you need to get the countertop which fits it best – you need a custom cut kitchen countertop for your home. This customization applies to both the physical size, as well as the color scheme. When you’re physically laying out your kitchen island’s size, you need to look at the distance between the island, your kitchen countertops, and the other fixtures in your kitchen. For a kitchen which usually has a single cook in it you will want 42 inches of clearance all the way around the island. For homes with two cooks in the kitchen at once, this should expand to 48 inches. A custom cut kitchen countertop will be needed for the best fit of the exact measurements of your home. Kitchens come in all manner of colors and design patterns. 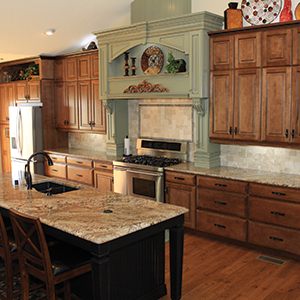 Choosing a kitchen countertop color that matches your overall design scheme is important. So important, in fact, that most people choose the kitchen countertop first, especially when they’re choosing granite, marble, or quartz countertops, and then design around it. Choosing a custom cut kitchen countertop will help you set the mood that you’re after in your kitchen, and will truly reflect your personality. Our team at Stone World has helped countless people in Nashville find the perfect custom cut kitchen countertop for their design ideas. Contact us today for expert advice on any of the questions that you may have about kitchen countertop size, layout, or color choice. Things get messy in your kitchen, this mess is usually focused on your kitchen countertops…although the floor is also a likely receiver of a few spills! Homeowners in Nashville contact us at Stone World frequently to see which are the best kitchen countertops to deal with spills. Here is some advice on the countertops most durable against spills that will prove to be useful when making material decisions. Quartz is the fourth hardest natural substance in the world. This incredible density makes it not only strong and durable, but also incredibly resistant to spills of anything you have in your kitchen. The density of quartz does not allow water to penetrate it and ruin the finish. Not only does a quartz countertop resist water, but it also resists stains. You’ll have to work to stain a quartz countertop, such as leaving spills for several days and not cleaning them properly. It can handle a little red wine, unlike a laminate kitchen countertop! Commonly, what people think are stains on a quartz countertop actually turn out to only be surface dirt that needs a little bit more elbow grease to get them out. 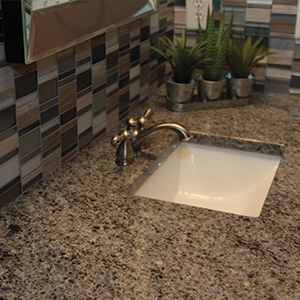 Granite is primarily composed of quartz, with this being the case it is also very dense and strong. The top of a granite countertop is slightly more porous than quartz and will absorb some moisture if you don’t have it properly sealed periodically. You’ll have to contact us and ask about the needs of your specific piece of quartz, but sealing should be done anywhere from every 1 – 10 years. 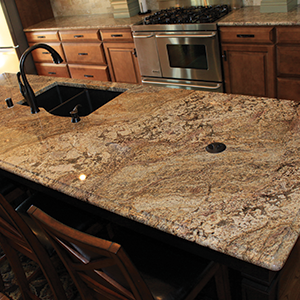 Granite also has high stain resistance, but again you’ll need to clean it up after a spill. Nothing on Earth is 100% stain resistant, but quartz and granite countertops come pretty close. This stain resistance is heightened by a regular sealing as well. Marble countertops are always an eye catcher, but they are admittedly slightly more work than granite and not as resistant to spills and staining as granite and quartz countertops. This is due to marble being a soft and porous stone. Marble demands prompt cleaning of spills to prevent staining. A good seal of the granite countertop will help prevent stains, but there’s no doubt about the fact that marble ranks third out of our three materials for stain resistant kitchen countertops. What to do about a stain on your kitchen countertop? If you have a stain on your kitchen countertop, and need the right advice on getting it off, contact us at Stone World today. Our knowledgable team have helped a number of frantic homeowners in Nashville, Tennessee get their kitchen countertop looking like new again. No matter how big your kitchen countertops are, it always seems like you can use just a little more space. Built in cutting boards for kitchen countertops have been around for decades, my grandmother had one in her kitchen, which was built in the 1930s, and they are still a popular commodity to have. Built in cutting boards are once again gaining in popularity in homes in Nashville, we’ll look at the styles that you can choose to incorporate into your kitchen countertop designs. This is a popular style for those who want their built in cutting board to pull out smoothly. The cutting board will be mounted to standard drawer pull outs. They will have stops on them which prevent them from being pulled too far, and the best will have a locking feature on them once you pull them out a certain distance. Pushing up on the bottom of the cutting board allows it to slide back in. This style of pull out cutting board is popular for those whose kitchen countertop, and overall design, is modern. The metal of the drawer pull outs always looks good in a modern kitchen with the frequent use of stainless steel and other metals. This is the original style of pull out cutting boards, and the one which was in my grandmother’s home. It simply slides out as the cutting board sits directly on the frame. Cutting boards are not heavy, unlike a drawer full of cutlery, so a metal pull out assembly is typically not needed. The cutting board will usually have some sort of stop affixed to the back of it to prevent it from being pulled all of the way out. It will lock in place due to the force you exert downwards on it which pushes it against the surrounding frame. This is low tech, but it is sure to last longer than metal drawer pull outs which may need to be replaced as they age. If your kitchen countertops don’t allow space for a built in cutting board, but you need more space, consider a cutting board which fits over your sink or over your cooking surface. One which goes over the sink can help you during washing, or allow you to sweep waste into the garbage disposal right away. One which goes over the cooking surface gives you room to prepare the food which is about to go into a pot or on a pan. For help determining what you can do with your kitchen countertop, check out our own gallery of kitchen design ideas. You’ll see a wide variety of cutting board styles. If you need to talk to someone, our team at our location in Nashville, Tennessee is ready to answer your questions. Nashville has a very distinct style and feel to it, and this applies equally to the bathrooms that are designed and built here. I’m going to outline a few of the most popular and interesting choices for the all important backsplash so that you can start thinking of the materials and final design for your bathroom remodel. These intricate and interesting backsplashes are made up of many tiny pieces of tile. They can be arranged to create countless memorable designs. Choosing one which perfectly matches your marble, quartz or granite bathroom countertop, by picking out key colors of the stone, can create a bathroom backsplash that has an incredible overall effect. Using a natural stone for your backsplash, and coupling it with sleek and modern fixtures, can make your bathroom look like a modern spa within a natural setting. Few things can create this sort of feeling like pairing stainless with a lightly coloured stone backsplash. This can be done with tiles, or larger slabs for the backsplash. Playing on the tile mosaic feeling, a bathroom that pairs pale colours, such as pastel blues, greens and yellows, with muted lighting, creates a bathroom which is relaxing long before you ever get into the bath. Choose a tile backsplash that meets these color choices, pair it with a bathroom cabinet countertop of a similar color, and feel calm wash over you when you enter. For a bonus tip, use minimalist furnishings and exposed plumbing to really give it an open, airy and relaxed feeling. A marble backsplash has been used by countless homeowners all over the world who are looking for a way to create the most grand backsplash. Matching a solid marble countertop with small marble tiles, that are woven into unique patterns, for the backsplash is a sure way to accomplish this. Lighting it to best present these two is interesting. You can go with bright lighting which highlights the white, bright feeling of marble, or go with a subdued yellow light which evokes relaxation. It comes down to whether you choose a white marble countertop that you want to shine, or if you choose a gray or yellow marble countertop to create a relaxing environment. Our design team at Stone World has helped people in Nashville do simple bathroom renovations that help them incorporate a new bathroom cabinet countertop, as well as complete bathroom overhauls. Take a look at our gallery to get your creativity flowing when you consider backsplash designs for your bathroom, and contact us when you have questions or need more guidance. The use of marble in the bathroom is popular amongst many people in Nashville. The use of marble countertops and tiles dates all the way back to Ancient Rome, and is a tradition that carries on today due to the high style and sophistication that it brings to a bathroom. How can you incorporate marble into your bathroom? Sophisticated bathroom styles will add incredible home value and luxury. A solid slab marble countertop is the most common way that marble is used in any bathroom renovation or build. Every bathroom countertop supplier worth their circular saw has marble countertops on offer, our own collection of marble is one of the most exciting in Nashville. The great thing about a marble countertop is that it goes with every type of fixture. Most people tend to go towards shiny stainless steel or chrome fixtures, these are certainly the more elegant choices that you can make. To perfectly complement that marble countertop, at a more affordable price per square foot, many people turn to marble tile backsplashes and floors. Finding large enough slabs to cover a floor is possible, but very costly and impractical to transport. Laying it down as a floor is also a challenge as cracks can appear as the floor shifts due to you walking on it. This is why it is much more common to see 12×12 inch marble tiles used to tie the flooring in with a marble countertop. 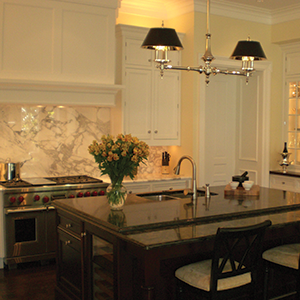 Marble backsplashes are typically used as they are then drawn into the overall scheme of the room and can act as a beginning point for a border that goes all the way around the room. Having a marble countertop sitting by itself can make it seem less grand. Having a shower which uses marble tile to complement it in an equally grand way is a choice that many homeowners in Nashville make when they want marble in their bathroom. The flexibility of tiles allow for different shower shapes to be accommodated. You may want to find another stone for your shower floor as marble does not do well with standing water. 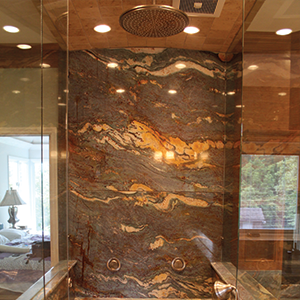 Our design team at Stone World have helped numerous homeowners in Nashville, TN build incredible marble bathrooms. For some design ideas to get you started, check out our bathroom gallery. Contact us when you’re ready to start really designing your bathroom with the sophistication of marble.